**PLEASE READ**: Don't fall for "chunky" shelves that are just made out of 1"x 6" boards from Home Depot!! Or shelves that are a "reclaimed LOOK" but are just new wood that has been beat up!! These are the real deal, made from cut down chicken barn rafters!! We take a great deal of pride in the authenticity of our shelves and their history. This absolutely gorgeous set of two shelves is handmade in Lancaster County, PA by an Amish man in his barn. The wood is reclaimed from Lancaster County chicken barn rafters and has all of the character that you would expect from reclaimed barn wood! Thick and sturdy with handmade raw metal brackets, these shelves make a stunning display on your wall! Please note that the brackets MUST be mounted into wall studs and the studs MUST predrilled. 3/16" bit recommended. Mounting hardware is included. 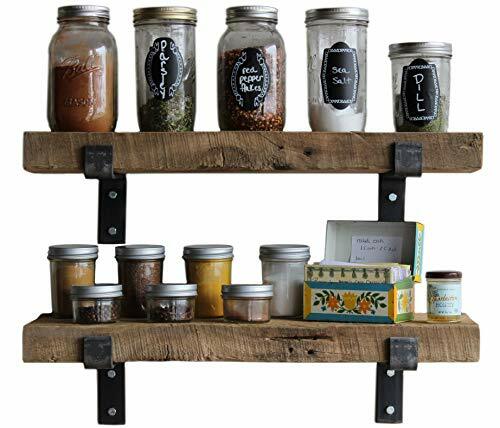 Shelves come with set screws that go up throughout the bracket into the bottom of the shelf to eliminate any movement due to any imperfections in the reclaimed wood. As these are 100% genuine reclaimed barn rafters , you may notice minimal variations in the shade. All saw, nail and other distressed characteristics (where wooden pins were installed to hold the rafter in place) are naturally occurring and will vary piece to piece. See examples in photos.